LEADING Scottish property consultants CKD Galbraith today announced plans to acquire the Buccleuch John Sale estate agency and chartered surveying business. The acquisition will result in a major expansion of the CKD Galbraith office network in Scotland and the range of property services provided by the firm. Buccleuch John Sale’s three offices and 30 staff in Kelso, Galashiels and Peebles will continue to serve the needs of their clients as a fully integrated part of CKD Galbraith. The prospective deal will take the number of CKD Galbraith offices in Scotland to 12, employing 160 people from Inverness to the Borders. 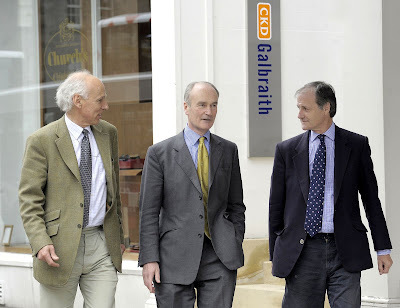 Heads of terms have been agreed between CKD Galbraith and The Buccleuch Group. Subject to the due diligence process being completed successfully, the acquisition is expected to be completed within a month. The Buccleuch Group chief executive John Glen said: “The Buccleuch Group purchased John Sale Ltd in April 2004 with the aim of growing its existing activities in the Borders and beyond. This was partly achieved by combining some of our in-house activities, but the existing market conditions now require it to extend its commercial reach further. Consequently, it makes for John Sale to join forces with CKD Galbraith for whom this represents a unique opportunity to move into the Borders, enabling both to fulfil their ambitions as the economy improves. There are currently 550 Ayrshire business stories permanently archived on this site. To locate those of most interest to you, please use the site search facility in the top left hand corner of this page. Type your search term in the white box, then click “SEARCH BLOG”.